Mere days before the BFI’s retrospective is due to kick off, the sad news of director Kaneto Shindo‘s death is making waves across the web. But the man has left us with an amazing legacy and days of films to get lost in. Here we look back at one of our favourites. I was about sixteen years old and an interest in what lay outside the confines of Hollywood cinema had begun to grow in me; Japanese films held a particular allure for all the predictable reasons that would thrill a teenage mind from Kent – attractive young women from a very different culture being violent, anime like Akira, Ninja Assassin and Ghost in the Shell (with lots of blood / stuff blowing up), and the general cultural cache of being into cult and foreign movies (or what seemed exotic and underground in Canterbury circa 1998). 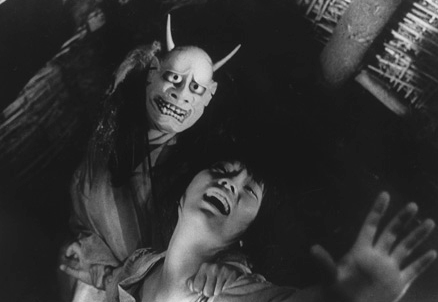 I can’t remember where exactly but, I had seen a still from Kaneto Shindo’s Onibaba and read a short review – I think it was the NME (yes, I used to read the NME) – and it was being shown very late on Channel 4 back in the days when Channel 4 still screened things worth watching. This was, of course, before the Film4 Channel, but even now you’re only likely to come across a film like this late night in the schedules after the 809th rerun of ‘Slumdog Millionaire’ that week. 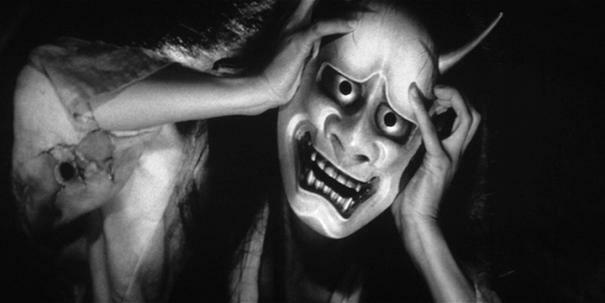 The still, rather tragically, reminded me of the Fighting Fantasy book ‘Sword of the Samurai’ where they had, I retrospectively discovered, nicked the iconic demon mask image from Onibaba for one of their more memorable monsters. I taped the film that night on my mum’s trusty VHS player and dutifully watched the film, slightly annoyed that I’d missed the first half hour due to various programming mistakes. I’d have to wait many years until the Criterion company, followed by Masters of Cinema in the UK, finally released a decent copy on DVD, so for years I was left with the slightly hazy impression of a wonderful film set entirely in swaying reed beds, sometime in feudal Japan during a vicious civil war, with two women in various states of undress murdering lost samurai, pushing them into a black hole and selling their weapons and armour to get by. Which, it turns out, is actually a rather large part of the film. So years pass, I nearly forget about Onibaba but my interest in cinema in all its forms grows and grows, and when I see that demon-mask once more online, I get my hands on the aforementioned Criterion copy (early on I’d worked out the mysteries of multi-region DVD players) and watch Shindo’s art-house horror, properly, for the very first time. I am glad to say that it held up to my teenage recollections. Existing in the grey area that makes a film sometimes appears too art-house to horror/cult fans, and too trashy for art-house cineastes, the film focuses on a middle aged woman and her daughter-in-law (whose husband has been killed during the war), who eke out a living in the reed beds from murder and theft. Then a man, Hatchi, arrives, a close friend of the young woman’s deceased husband. A sexual relationship begins to develop between them, threatening to destabilise and ruin the already tenuous relationship between the two women. The older woman’s sexual jealously becomes, literally, a demonic force in this film; she becomes the very thing she warns the young woman about, personifying destructive lust and corrosive jealousy. Let us just say the demon-mask plays a crucial role in this. Visually the film is stunning; in fact it is the most appealing thing about the picture, as the bare bones of the story are rather slender, loosely based on a simple Buddhist instructional tale. 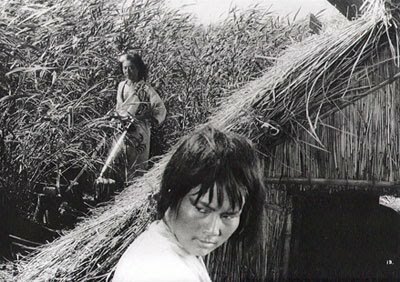 But it’s all in the presentation, and the film’s lustrous black and white photography from director of photography Kiyomi Kuroda is beautiful, as is the marshland location which is as much a psychological landscape as anything; the swaying reeds are only punctuated by the river, the hut of the two women, and the infamous black hole. The setting adds a great deal of physical and metaphorical depth to the simple story, and the entirety of the drama plays itself out within this landscape, culminating in one of the most memorable endings in horror cinema that stayed with me even from my initial shaky VHS viewing all those years ago. Kaneto Shindo has made many other films in his long career (he was born in 1912 and is still not dead), such as Children of Hiroshima, the strange feline ghost story Kuroneko (also available from Masters of Cinema), the remarkable, near silent analysis of Japanese island peasants in The Naked Island, before making a lot soft-core erotica during the pinku eiga era; but Onibaba remains his best and most recognisable film. Highly recommended.  This entry was posted in Gary Budden, Masters of Cinema, opines. Bookmark the permalink.